This summer I took on a new protege - the Miss Anna of Jackson Street. (Four houses down from us...doesn't that name sound so very English and thrilling???) Anna is a homeschooled teen with interests in fashion, art, blogging, and photography, so naturally we were kindred spirits and I insisted on mentoring her once a week. It has been so fun getting to teach and share our life with her! We always begin our chats in the kitchen while I pull us a couple of double espressos over ice and then we meander to my studio where our conversations are very loosely structured around the principles and elements of art and design, current inspiring photographers, stylized photoshoot ideas, manual camera settings, crafting wardrobes, business and entrepreneurial tips, good books, philosophy, and on and on...it is so. Much. FUN! Homework consists of Pinterest research and focusing on one element to shoot (e.g. line, color, etc.). And tests, well, tests are the funnest of all. The best way to use the skills we learn are to practice, so we style photoshoots finding light, deliberating over backgrounds, gathering items to use and then arranging them just so for that perfect composition. Then we bring our treasures to the computer and analyze the merits of each image, critiquing to make improvements. 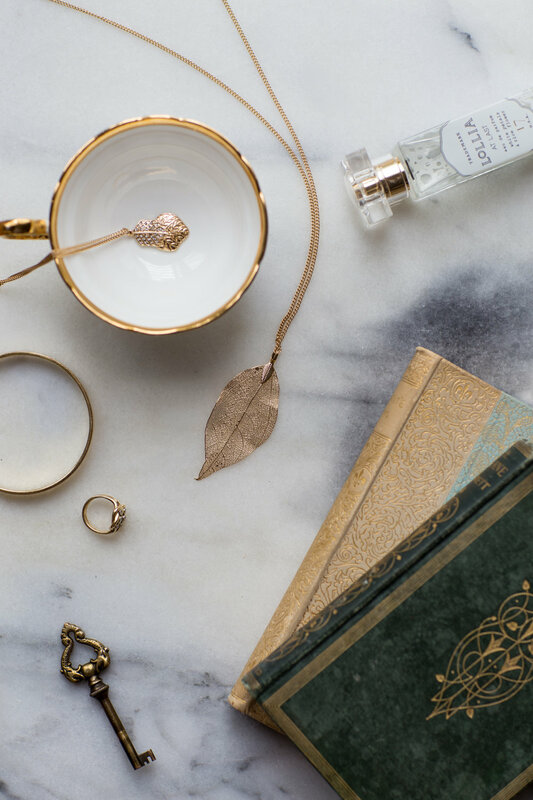 Last week I was inspired by Anna's golden necklace of leaves so I ran around the house collecting anything I thought might lend itself well to our shoot - an antique book of turquoise and gold, an olive wood bowl with golden rings, an old inherited key, a golden-rimmed tea cup, some perfume...and the results were stunning! Cheers to makers and kindred spirits!